With 49 teams, 2056 finished in first after playing in 10 qualification matches at the Greater Toronto East Regional in Oshawa. The team went 10 and 0 with a ranking score of 35. 6 points higher than the next best team. 2056 chose team 118 from League City, Texas, and team 2634 from Toronto as the number one alliance. Team 746 also from Toronto was brought in as a backup robot when 2634 took too many hits to the chin and was unable to compete. The alliance went on to win the quarter finals and semi-finals each, two games straight. 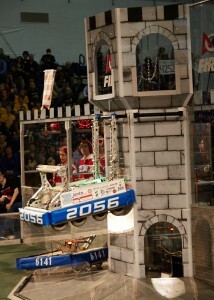 In the finals, the alliance lost the first match 130 to 158 but came back and won the next two, 200 to 179 and 180 to 140, giving the win to the 2056 alliance. 200 points was the current high score but was overtaken in a match in California later in the weekend. The Team received the Motorola Quality Award at the event and the Regional win gave the team its 23rd consecutive. March 23, 2016in Uncategorisedby adminComments Off on 2016 GTR East Winners!